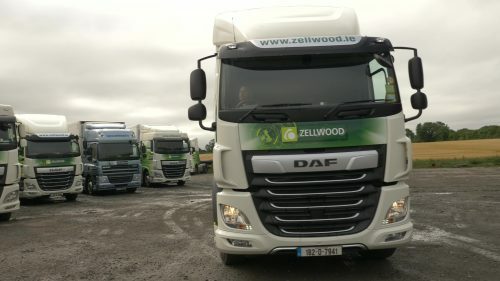 Award-winning Dublin chilled-foods distributor Zellwood Ltd is part-way through a delivery of six new DAF XF tractor-units from DAF Ireland, bringing the total size of their DAF-only fleet to over 70 vehicles. Zellwood has been in operation since its founding in 1995, when brothers William and Mark Flanagan began working two small trucks at the Dublin fruit markets. Now, 23 years on, Zellwood boasts an extensive DAF Trucks fleet with over 130 drivers and a customer base across the length of Ireland and the UK. For Company Director William Flanagan a strong business relationship is as important to the business as a hard-working truck – something he has learned from Zellwood’s 10-year relationship with local Dublin based DAF dealership, DAF Ireland. The six new XF trucks will be joining Zellwood’s fleet by the end of the month, where they will be put into service delivering temperature-controlled foods across the UK.